Rhodes is one of the most popular islands in the Greek isles due to its cheap flights. Of course, it’s Greece, so it’s sure to give you sun and a great time. We love Greece and have made several trips to explore the different islands. Rhodes is packed with plenty of things to do so I’m certain you’ll have a great time. There are so many things to do in Rhodes, including a ton of free beaches so it will be hard to ever get bored. Rhodes is known for being one of the most diverse Greek Isles and packed with history due to its geographical significance. With its fascinating history dating back to antiquity, finding unusual things to do in Rhodes town won’t be a problem. Perhaps, the most important step you’ll make on your trip to the island is Old Town Rhodes. The old town features architecture and relics left behind by the various groups who have controlled the island over its history. When we first arrived in Rhodes on board a gulet cruise based out of Turkey we were blown away by Rhodes old town. We arrived in the evening watched the sunset and then wandered through the ancient streets into the night. Near the town’s center, there are minarets, Turkish baths, a mosque, a synagogue, and Italian monuments. Meandering through the town’s dizzying and enchanting mishmash of small streets will make you feel like you’ve been sucked into a vortex and deposited in a different era. While many of the attractions on the island are best experienced with a guide, old town is one of those places where the town’s essence seems to flow right into you without the constant ramblings of a well-meaning tour guide. If you’re lucky enough to find yourself on Socrates Street, stop for a cappuccino, gelato or souvenir, as this is the main tourist street. If you’re interested in hanging around after hours, the city is known for its lively nightlife too. Housed in a beautiful art deco building built in the ’30s, the aquarium – or Hydro-Biological Station of Rhodes – was built to be visually pleasing, both inside and out. We’re not big on animal enclosures or aquariums; however, the building is a nice piece of architecture and worth a stop for some photos. Ellis beach is one of the best beaches in Rhodes and it also happens to be the closest to Rhodes town. It’s a super popular beach and considered to be one of the most beautiful in the Dodecanese islands, granted we don’t agree with that. The beach has a plethora of chairs and umbrellas for rent along with tavernas and hotels on the beach front. We came for a chance to take dive off the awesome diving board located in the middle of the ocean. 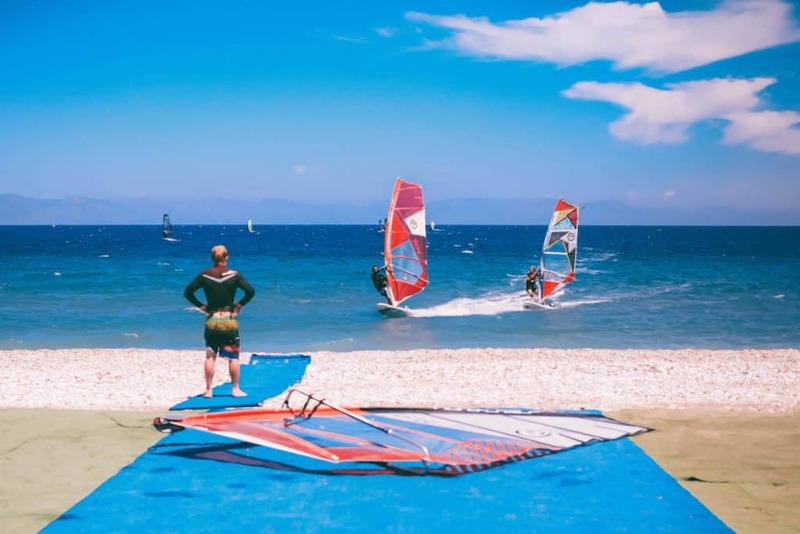 Along with being a great spot to catch some sun, there are a plethora of water sports you can try out. We gave windsurfing a try. 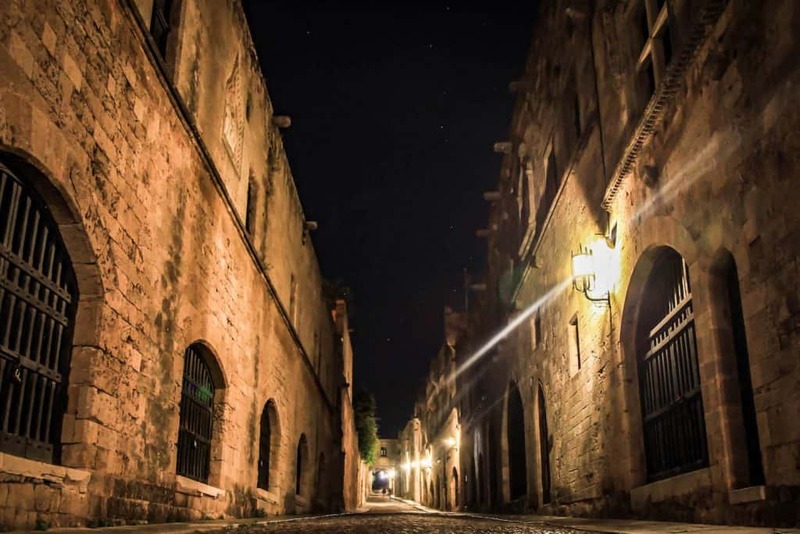 This medieval street was once the home to the famed Knights of Hospitaller who ruled over Rhodes. The street was divided into seven languages where knights were organized according to their birthplace – France, Germany, England, Auvergne, Italy, and Provence. Each of the knights was responsible for their own section of the fortifications of Rhodes town. Once you start walking down the street you feel as if you’ve been instantly transported back in time. It appears as little has changed other than a few lights that could be lanterns in the last 700 years. This was the first place we ever went scuba diving in our lives. It was an exhilarating excursion to do in Rhodes and anyone looking to experience what lies in our oceans should give scuba a try. We’ve since gotten our open water certification but still look back to the very first place we ever went scuba diving. We went with Waterhoppers who operate out of Rhodes harbor. You can read more about our scuba experience in Rhodes here. 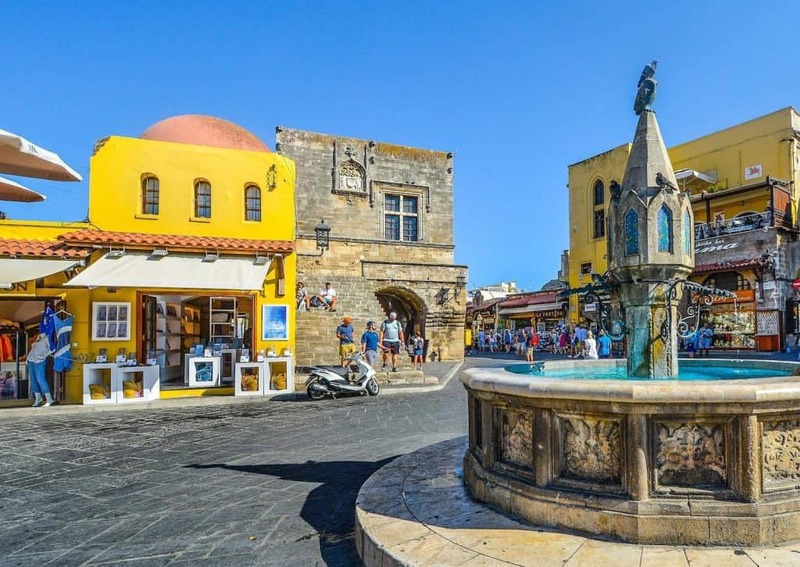 In case you missed it while meandering your way through the streets of Old Town Rhodes, make it a point to head to the majestic Palace of Grand Masters – also known as the Kastello. Its size and sheer presence seem to draw gazes from all over town, which makes missing it kind of impossible. One of the only examples of gothic architecture in Greece, it functioned as a palace, military headquarters, and fort, and according to recent excavations, it may be the very site where the ancient Colossus of Rhodes stood. If your timing is good, you may catch one of the many special exhibits or festivals that are common in Old Town throughout the year. One of Greece’s oldest and most popular archaeological sites, the Acropolis of Lindos is built into a dramatic, rocky bluff nearly 300 feet high. Sandwiched between Saint Paul’s Bay and the town below, the view from the top is memorable, to say the least. Located in the island’s south, about 45 km from the city of Rhodes, it has been used as a fort by various factions throughout history, including the Greeks, Romans, and Turks. In ancient times, Lindos was important and prosperous due to its location along the sea lanes between Greece, the Middle East, Europe, and Russia. 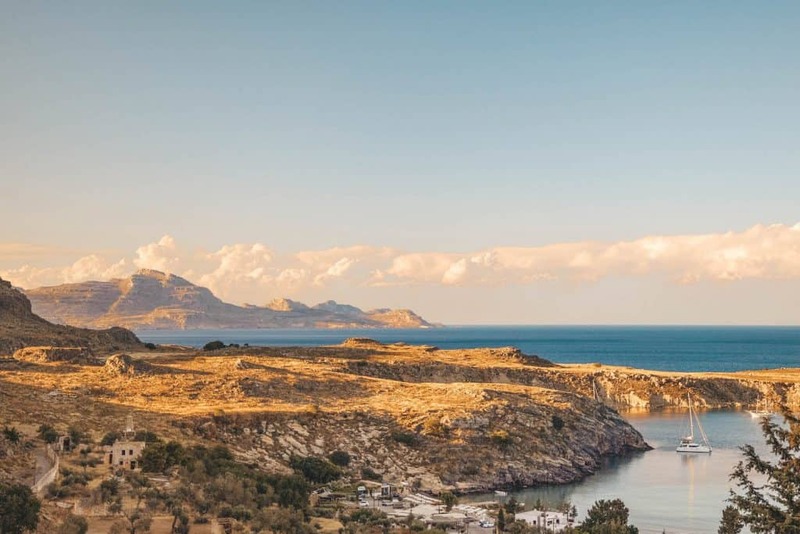 Though its prosperity waned over the years, its majestic beauty has persevered, but remember, Lindos is a pedestrian-only site, so bring your walking shoes. For those who don’t think they can manage the walk, donkey tours are available, but the trip up the ancient path shouldn’t take more than 20 minutes. After a hike up to the Acropolis in the hot sun head down to the beautiful beach below for a swim. There are plenty of places to rent chairs and umbrellas, and a section to layout with just a towel. The water here is very calm and clear making it a wonderful place to go for a swim along with a sandy beach. It’s a bit of rarity as many of the beaches on Rhodes are smooth stones. Chilling here is one of the best things to do in Rhodes for families and children. 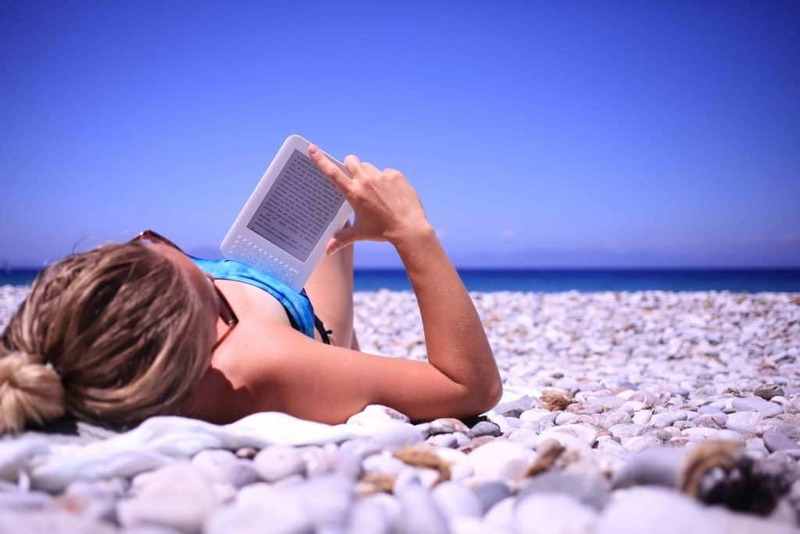 If you need a beach packing list find ours here with a checklist. You don’t need to drive all the way to Lindos. Instead, you can take a boat cruise along the beautiful coastline. Book Your Boat Tour Here! 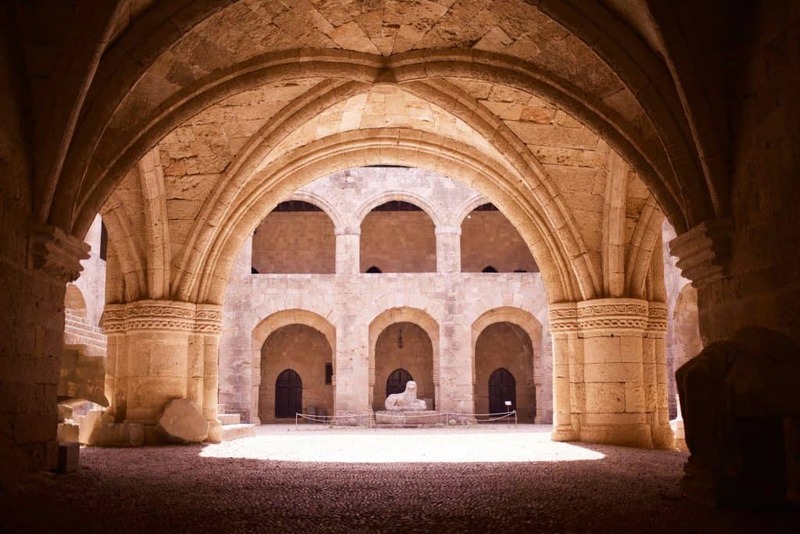 Sure, there are lots of great things to do in Rhodes, like exploring ruins, castles and archaeological sites from antiquity, but there are also contemporary attractions that should be on your to-do list as well. To get out of the sun and take a refreshing break from antiquity, head to the Artistic Village Contemporary Museum. You’ll find many artists from the same family whose art is displayed working there, and they’ll be happy to answer any questions you may have. You won’t find any of the overpriced and overdone tourist gizmos and knickknacks that you will at the other stores. Be prepared to be delighted by the quirky, imaginative and colorful works on display here. Your kids will love the artwork’s off-the-wall nature and don’t be afraid to buy something, even if it’s breakable, because the staff will be more than happy to wrap it for you to withstand the trip home. Just a convenient hop, skip and jump from the city of Rhodes, is a place that draws nature lovers from all over the world. Set inside rocky hills covered with green foliage that provides much-needed shade on hot days, it’s a magic place where butterflies come every year from June until September to mate and leave their eggs, ensuring survival for the next generation. Convenient little bridges and walkways have been constructed to make getting around easy. If you happen to be there at the height of the migration, the butterflies may be so thick they’ll make the trees and hills look like their alive. It’s one of the most fascinating things to do in Rhodes, especially for kids. There’s a café and gift shop too if you’re inclined to buy a souvenir. If by some chance you didn’t get your fill of nature at Butterfly Valley, then a trip to Seven Springs should do the trick. You can get there by car, bus, taxi or bicycle. Small, slightly off the beaten path, and no more than a half hour from the city of Rhodes, Sevens Springs can be a peaceful oasis from the hustle and bustle of the town. With old wells and an aqueduct, there are lots of interesting things to see and discover. The cool stream that runs through the park attracts insects, frogs, and waterfowl, and the water is accessible, so it’s a great place for kids to slop around and be kids. Due to their proximity, you may want to head to Archangelos and visit the ruins of the castle of St. John too. Built in 1309, the citadel has a fascinating history and lots of dramatic views from the top too. Don’t let the big name scare you; in laymen’s terms, it just means a neat place to see cool old stuff. It’s a great place to spend an afternoon looking at petrified fossils from bygone eras and locations around the world, some dating back as far as 400 million years. There are beautiful and bizarre rocks, geodes and crystal formations, and there’s also a large hall which has been set up as a movie theatre, where visitors can take a load off and watch interesting films about nature on a big screen. There’s also a gift shop on site, entry is free, and, according to the website, they’re open from Monday to Sunday, 9:00 am to 5:00 pm. Hiking is wonderful on the island and one of the great free things to do in Rhodes. The recent history of this serene bay is quite interesting. It owes its name to the famed actor Anthony Quinn who decided to buy the isolated bay in order to create a center for artists. However, after making the purchase the Greek government annulled the sale and seized the land. It deeply hurt the star and he along with his family vowed never to return to Rhodes or Greece again. His family even took the case to the Greek supreme court, but it never got to the end. To this day it’s still a contested issue that will likely never get solved. However, the bay makes for a beautiful hike and swim. The hike along the bay was a highlight of our trip to Rhodes and one the few times we were able to escape the majority of tourists on the island. You can find the beach here. This cafe puts on astronomical experience every night of the week. In the summertime, you should expect a bit of wait, but you can pass the time walking around the garden and having a drink. However, once you’ve waited your turn they’ll take you into their observatory to point a few planets and stars out through the large telescope. On a clear night the view of the moon through the telescope is unreal and well worth a trip for families and couples as it is both romantic and fun. If you’re with a loved one it’s definitely one of the most romantic things to do in Rhodes at night. Let’s face it, ancient history isn’t the most interesting topic to a lot of children, but thankfully, there are lots of kid-friendly things to do in Rhodes too. To lighten things up a bit, and hopefully remove that blank look that’s been on their faces since the trip to the Acropolis of Lindos, take a few mornings or afternoon hours out of your schedule to give them something they’ll really enjoy. Near the quaint village of Archipoli, the museum is surrounded by olive trees and scenic mountains and gets all of its energy from the sun, which isn’t in short supply here. The toys in the museum have one thing in common: they were all made in Greece and cover the timespan between the ’30s and ’90s and include all manner of toys, many of which are similar to the toys you grew up with. If you’re like me, you secretly scoff as the airport security guards scoot by on their industrial-grade Segways, looking silly and official with their leather holstered cans of pepper spray and bicycle helmets. But secretly, I’ve always wished I could drive one of them. If you’ve secretly coveted a scoot on a Segway too, your trip to Rhodes will be just what the doctor ordered. Not only are they fun, convenient and effortless, it’ll give your crabby grandma another excuse to gripe about having to walk three miles to school in the snow when she was just a tot. Imagine seeing ancient ruins on a new-fangled gadget like the Segway, hosted by a professional and knowledgeable tour guide. Supposedly the oldest park in the world and within a few kilometers from downtown Rhodes, Rodini Park may be the perfect and peaceful way to end a long day. A pleasant mix of overgrown and manicured, it’s full of thick vegetation and enchanting trails that lead you by babbling brooks, quiet pools, drinking animals and ancient aqueducts. There are a group of peacocks that live on the grounds that aren’t shy and will show you their famous plumage if you’re lucky. There’s no park entrance fee or hours of operation, so go when you feel like a little nature is what you need to soothe your rough edges. There are waterparks, and then there are waterparks on steroids. If you prefer the latter, then the Faliraki Waterpark will quench your desire for fun, sun, and adrenaline. With massive waterslides and waves and pools of all shapes and sizes, there will be something sensational and safe for every member of the family. If you’d rather just watch from a safe distance, that’s okay too, deck chairs and refreshments are available. According to their website, the park opens at 9:30 in the morning and is just across the street from Esperos Palace. Put everything you think you know about thermal springs out of your mind. As one of the most luxurious things to do in Rhodes, it’s more like private-island meets spa for the hopelessly rich and famous. Don’t worry if you just had your car repossessed and sold a kidney to pay for your trip, the entrance fee won’t break the bank, and the facilities, staff, and views will make you feel like a high-roller. Lounging in the soothingly hot water bubbling from the earth below is a great way to soothe your soul and your tired feet. The largest of the Dodecanese Islands, and nearer to Turkey than Greece, Rhodes is dripping with history, culture and culinary influences from its neighbors and cosmopolitan past. Known for its fresh ingredients and healthy food, the island has become a hotspot for young chefs and fusion cuisine, which mixes traditional dishes with a modern twist and international flare. But don’t worry, if trendy isn’t your thing, you’ll find plenty of traditional Greek restaurants, and if a burger and beer is more your speed, you’ll find that too. Thanks to our some advice from our friendly guesthouse owners we took our motorbike and went into the town of Maritsa for local tavernas. 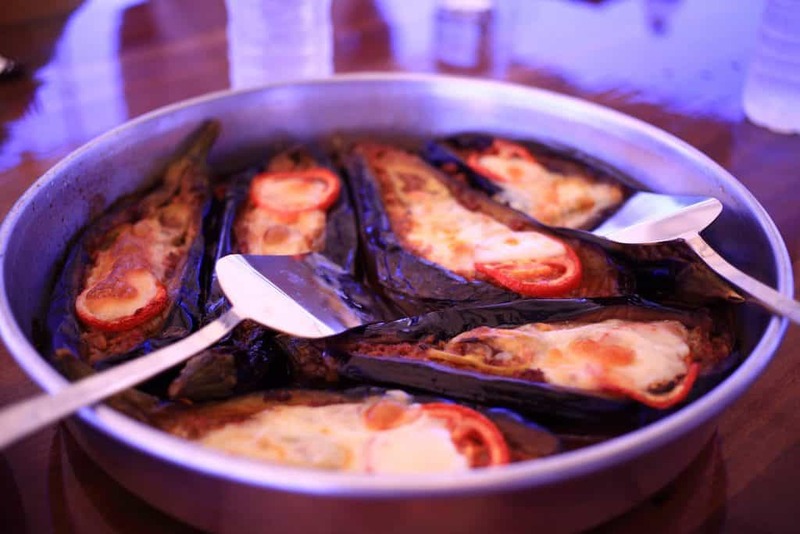 Traditional tavernas do not operate on a menu more as you have mezze or a series of “small” plates brought out to you one after another. It’s always based on what’s available and you eat until you’re stuffed. It’s a traditional way of life in Greece. You eat and drink with family and friends for several hours into the late hours of the night. One of their most charming traditions and something you have to dig a little to find outside of the traditional tourist haunts. There are few popular ways to travel around Rhodes. Rental car, moped, or ATV. Rhodes is a relatively large island and if you are a family a rental car is the number one way to go. Just be aware that sometimes the Greeks can drive a little…crazy. If it’s your first time renting a car make sure to read a few of our tips. The most popular way to get around is via motorbike. You can usually rent a motorbike for about €15 a day, and the Greeks are generally willing to cut you a deal if the longer you rent. Airbnb: For larger groups and families I highly recommend staying at Airbnb. Greece has amazing food both in the restaurants and the grocery store and it’s fabulous to be able to cook your own food with a big group. Airbnb’s let you have your own kitchen and stay together as a group rather than separating a group between rooms. Check out all our Airbnb tips here, and make sure you get €20 off your first stay. Wondering what to wear in Greece? 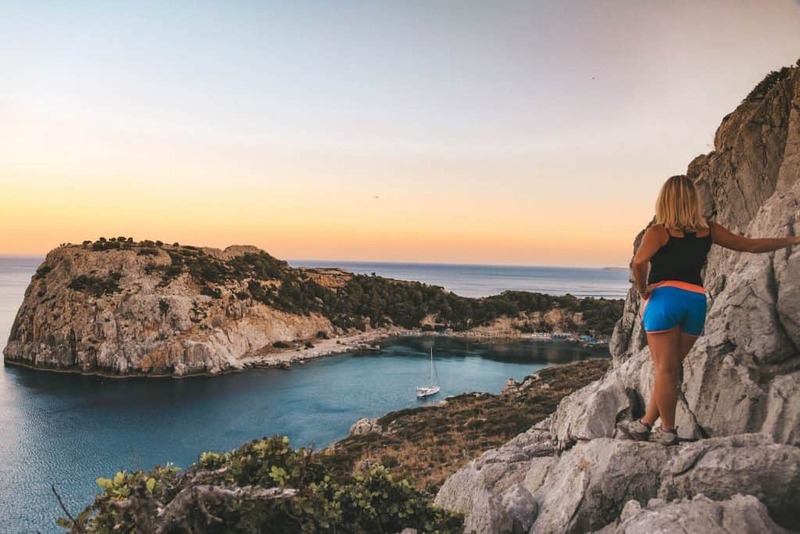 Check out our ultimate Greece packing list! Rent a car: Compare car rental prices here. Adapter: Power sockets in Greece are type C and F, like most of Europe. You can pick up this travel adapter. Currency: Greece uses the Euros. ATM’s are located in the main towns and the majority of businesses run on cash due to strict bank laws in Greece.